Another aspect which contributed to Hat Trick's failure to deliver was America's choice to take some time off after the album was released instead of touring aggressively. Gerry later commented that "this was an incredibly risky thing to do at that point in our career," but that they needed to slow down. It was during this time that they opted to take a break from producing themselves. In a daring move, they decided to contact the most legendary producer of all time -- the Beatles' George Martin. Hat Trick was so heavy that after a year went by we still wanted a producer and we told Elliott, our manager, about George Martin being our choice. And Elliott said, "Well it's a coincidence because George is over in L.A. now; he's been nominated for some Academy Award and he's in town." So he arranged a meeting. George later told us that he was considering retiring right before this project. This was like a turning point for him, too, because at that time he wasn't doing anybody else. So the big meeting was finally arranged. He came in and made himself comfortable, he took his shoes off and all this stuff, and said, "Oh! It's so hot here in your country, but I'm having a great time -- lovely to meet you lads." We ran down ideas that we had for the album and let him hear as many songs as possible, but he didn't really get too involved in picking the material. Right away he said, "I'll go for it under one condition: your manager, Elliott, tells me you take a long time to record. Well because of that I want to do it in my own studios in London, rather than me getting hung up over here." So we said great, anything you want, we'll go over there. So in April 1974, the trio travelled to London, England, to record their fourth album in Martin's own AIR studios. Unlike Homecoming and Hat Trick, which featured a handful of guest musicians, the new sessions would feature only the trio and their new drummer, Willie Leacox. Hat Trick's bassist, David Dickey, wasn't involved with the new recordings; the trio would handle the task themselves. Leacox, the only member of the group to have received a degree in music, had been a drummer all of his life, coming from a musical family -- his father and uncle had played in big bands during the postwar period. Having grown up in the Midwest, Leacox came to California in the early '70s in an attempt to break into the music industry. In 1972, actor David Jolliffe suggested that Leacox try out as America's drummer. His audition went about as well as possible -- he has been their drummer from then on. We were real nervous going into it because we respected George Martin so much. He was a real leader of the music business, a giant if you will, and so here we were, these young guys. So we prepared ourselves real well for that album because the album before, Hat Trick, we had spent a few months on... George was concerned that that was our approach to every project. He was good with us in the studio because we were sometimes almost a little too picky. We would spend maybe ten, twelve, fifteen takes on trying to get every note of the song right and make sure it was 100% perfect. But with George we'd go in and maybe do two or three takes and he'd say, "OK, that's it," and we'd say, "Well, wait a minute, so-and-so forgot to play this," and he goes, "Well we can do that on an overdub. But the feel was good. That was the right feel that you're looking for in the song.'" So he really taught me a lot and taught us a lot about recording and translating a song from the idea that you have in your head to keeping that feel and putting it down on tape... If nothing else he had a lot of great stories to tell about his days with the Beatles. George is a tremendously talented musician in his own right, and the arrangements that he would write for different songs were often better than the songs that they were wrapped around. The whole feel that he had for making a hit record -- he really had a good ear for a commercial song. The album which took shape at AIR studios became a blend of America's skill at fine harmony and uncluttered songwriting with George's knack for luscious orchestration and sonic treats. The first track, "Miniature," was a grand introduction to the new sound, almost as if it had been extracted from the soundtrack of an epic film. Amazingly, the whole album was completed in less than three weeks under the guidance of George Martin. "Tin Man" was selected as the first single to promote the album during the summer of 1974. Partly because the song was infectious, and partly due to the status of anything involved with George Martin, the song received heavy airplay, and by October the song was climbing up in the charts. Soon it became their first Top 40 hit in a year and a half. By early November, it had reached Number Four on the Billboard singles chart, their biggest hit since "A Horse With No Name." It was clear that America, with their sleeker pop sound, was back. But their new album, entitled Holiday because of their trip to England, was more than just "Tin Man." It was the consummate pop album in that all of its tracks were given the same kind of care in writing and production as were the hit singles, an established trademark for both America and George Martin. Gerry's "Another Try" is often cited as one of America's most satisfying songs, despite the fact that it was never a hit single. Certainly it is one of Gerry's favorites. The use of strings and brass in combination with biting lyrics about family strife made it a very compelling song, one which has never left the regular concert playlist since. "Hollywood" is a paradoxical song in which bright lyrics like "golden palm tree" and "soaring through the heavens" contrast sharply with the moody trance of the repetitive guitar and Dewey's brooding vocals. This was an unusual America effort in that there was no harmonizing by Gerry and Dan; Dewey's vocals essentially carried the entire song, supported by little more than sparing guitar work and background crowd noises. "Old Man Took" was something of an autobiographical song by Dewey written about experiences during his youth when he lived in Biloxi, Mississippi. Gerry's "What Does It Matter" features a retro theme, with a mono vocal and references to a photograph, "silver-framed and velvet-backed." This line explains the Gary Burden-designed album cover, featuring old-fashioned photos of the group (now a foursome with Willie Leacox) by Gered Mankowitz. I've had a lot of letters from people, a lot of people coming up to me personally, and... some have even said it literally changed their life. When you have that kind of response, that's what you're looking for really as an artist. Every artist is trying to convey some kind of a message. It may be as simple as, "Let's all let our hair down and have a good time"... So I'm happy that "Lonely People'" has a good message and one that people have received, and one that has touched a lot of people. Due to George Martin's prestige, the wild successes of "Tin Man" and "Lonely People," and the general strength of the album, Holiday rose to Number Three on the Billboard album charts and remained charted for over a year, the longest run of any America album save for History/America's Greatest Hits. With Dan, Gerry, and Dewey back in the limelight with their most recent successes, they were in demand as studio musicians as well, primarily as background vocalists. Between 1974 and 1975, they were variously involved in projects with Dan Fogelberg, David Cassidy, and singer/songwriter David Blue. While Holiday was still at the top of the charts, America and George Martin were already hard at work on the follow-up album. After the quick pace with which their first collaboration was completed, George felt comfortable enough to make the trek out to California for the new project. They got to work at the Record Plant in Sausalito in January 1975, renting out houses while staying in the Bay Area. David Dickey rejoined the group on bass, who along with Willie Leacox gave the group a strong and stable rhythm section both for recording in the studio and touring on the road. The album was completed in a little over three weeks -- about the same time it took to make Holiday. It was called Hearts, possibly in reference to San Francisco being known as the home of the "Summer Of Love" of 1967. By 1975, it had become something of a tradition for America to pick an album title that began with the letter "H." Homecoming and Hat Trick had coincidentally started with "H," but by Holiday and Hearts it was something of a running joke. Hearts picked up right where Holiday left off, with the successful combination of America's elemental songwriting and instrumentation and George's artful orchestration adding an extra dimension to their sound. Perhaps the album's most notable example of this collaboration was Dewey's "Seasons," in which his simple acoustic melody and vivid lyrics were perfectly complemented by the animated strings and brass in the background. "The Story Of A Teenager," co-written by Dan and Gerry, blended keyboards and a thick layering of strings to capture the feel of the turmoil of youth. "Tomorrow" and "Old Virginia" were more sparing in their use of orchestration, but when they were employed, such as the violins in "Tomorrow" and the pleasant flute of "Old Virginia," the results were right on target. [Jackson Browne] has a knack, an ability to put words to music, that is much more like the L.A. approach to just genuine observation as opposed to simplifying it down to its bare essentials... I find Jackson can depress me a little bit, but only through his honesty; and it was that style of his which led to a song of mine, "Sister Golden Hair," which is probably the more L.A. of my lyrics: "I tried to make it Sunday but got so damn depressed, Set my sights on Monday and I got myself undressed." Then I realized, wait a minute, it was all just coming out like words. Also: "I ain't ready for the altar" was one of the first times I used 'ain't' in a song, but I wasn't making an effort to. I was just putting myself in that frame of mind and I got those kind of lyrics out of it. At a time when acts like the Eagles, Jackson Browne, and Linda Ronstadt were crowding the top of the charts, "Sister Golden Hair" was perfectly placed for success. The song appeared in the Top 40 singles chart in April 1975, just a month after "Lonely People" peaked at Number Five, and on June 14, after heavy airplay, it became the second America song to top the singles chart, edging out "Thank God I'm A Country Boy" by John Denver. A week later, "Sister Golden Hair" itself was replaced at the top by the Captain & Tennille's breakthrough hit, "Love Will Keep Us Together." It was as if the phrase "captive audience'" was coined for America. From the moment they stepped onto the stage the crowd did nothing but cheer. The May 9 show opened with a clean, crisp rendition of "Tin Man" and the group displayed the feature for which they are best known, fine harmony. They continued the momentum with highlights such as "Don't Cross The River," "Company," and a mighty version of "Ventura Highway." They have a total sound, strong vocals and strong instrumentals. This material is a departure from the easy listening one expects from America. Dan Peek mans an electric guitar and the group transforms into a rock group. The pleasant harmonies of Dewey Bunnell and Jerry Beckley [sic] remain, enhancing the driving electric force. The crowd kept cheering throughout the entire 70-minute set. America, then, returned for an exciting encore of "Sandman." After a standing ovation, they returned again to play the second encore, "Horse With No Name," the tune that brought the group to fame. After some 23 songs, the audience was still eager and continued to applaud for 10 minutes. This show proves that America is a safe bet for continued success. [George] truly did become a member of the band. On that song in particular ["Daisy Jane"], the actual cello break in the middle -- it shows you the kind of involvement he had -- we just left it blank. I said, "George, right here you're gonna put a nice something-or-other, and he says, 'I know just what you mean.'" The song had great potential, and while it did climb the charts, it could do no better than number 20 in September 1975. While its commercial performance was relatively disappointing, it has been a concert favorite ever since and to many fans it is one of America's most endearing works. With the heavy exposure of both "Sister Golden Hair" and "Daisy Jane," the parent album Hearts was able to nearly duplicate the chart performance of its predecessor, Holiday, by rising up to Number Four on the Billboard album charts and earning the group its fourth gold record in five tries. "We played this hall four years ago with, er... Family," said Dewey Bunnell from the stage of the Manchester Free Trade last Thursday. "It's good to be back. It really is." Since then the trio, who are now enlarged to a quintet with the addition of regular bass and drums, have not been seen much on this side of the Atlantic. There was one concert at the Royal Festival Hall two years ago, but no tour, a state of affairs that must surely be reflected in the group's disappointing U.K. album sales of late. Of the three, who left England three years ago, only Beckley retains his ties closely. The other two have settled in California. Beckley has a house in Sussex, a cottage that he lives in for slightly more than a month each year, partly for tax reasons, and partly because he simply hasn't the time any more. He does look on England as home, though, and sincerely wishes there could be more U.K. tours. "I grew up here more than in the States, and I'd rather call my place in Sussex home than L.A., but where we live isn't important." The initial move to the States was sudden but logical: "We were watching the success that was going down in the States and thought it was better to be there and have an American manager rather than to watch it from here and hope it was being done right." The next album, though, will be a greatest hits, titled, "History" and it's due out in October in the States and later here. Predictably, it's a collection of singles, all of which were top twenty numbers in the States. Martin will, in fact, re-mix the early tracks that he wasn't involved with at the time. When History/America's Greatest Hits was released in October 1975, it seemed somewhat premature, given that America was still in the midst of a hot streak of hits. In the previous twelve months, America had scored three Top Ten hits, one of them a Number One single, plus a Top 20 hit in "Daisy Jane." But given hits like "A Horse With No Name," "I Need You," and "Ventura Highway" from the early days, there was more than enough material for a retrospective. All of the charting hits from "A Horse With No Name" to "Daisy Jane" were included, as was the upcoming single from Hearts, "Woman Tonight." Also included was an edited version of "Sandman" from the first album. It was also a chance for George Martin to put a stamp on some of America's biggest songs from before his tenure as producer. The pre-1974 songs were slightly remixed for refinement, most notably "Don't Cross The River," which now featured a fiddle in the background. The album's artwork was notable as well. On the front album cover, artist Phil Hartmann (later a famous "Saturday Night Live" comedian once he dropped an "n" from his last name) painted a montage of Dewey, Gerry, and Dan. The painting was full of symbolism. The rendering of Big Ben on the left and the Golden Gate Bridge on the right was meant to show the group's move from England to California. 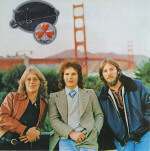 The selection of the Golden Gate Bridge itself was taken from the Hearts album cover, while the vintage car scene at the bottom was from Holiday. The bush behind the car was inventively used as Gerry's shirt, and the drawings of Dewey and Dan are taken from photographs included in the Hat Trick poster. On the back cover, we see a sketch of an idealized Hollywood landscape, with David Dickey and Willie Leacox standing by the Crossroads Of The World building. History/America's Greatest Hits was a big seller right from the start. By December, the retrospective had become a major hit in its own right, climbing to Number Three on the album charts and continuing to sell heavily well into 1977. On December 1, 1975, History was certified gold, America's sixth in all. Partly due to its exposure on both Hearts and History, in January 1976, the quirky Dan Peek song, "Woman Tonight," made a brief appearance in the charts, peaking at number 44. What was notable on this track was how much it deviated from America's trademark easy-listening sound. The percussion was unorthodox, and all kinds of trendy sounds were thrown in, from the latest synthesizer and guitar licks to a chorus of female singers, a legacy of the crossover tendency of R&B music during the mid-'70s. These same singers were also featured on another track from Hearts, "Half A Man," also a Peek composition. 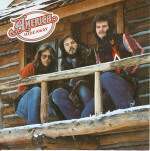 In order to capture some of the momentum of the outstanding success of History, in February 1976 America assembled at the Caribou Ranch just outside of Nederland, Colorado, to record their next studio album with George. Established during the early '70s by Chicago producer James William Guercio, the Caribou Ranch Studios had seen quite a few stars, including Elton John, who named his 1974 album, Caribou, after the ranch. America, too, named their album after the ranch, but in keeping with the "H" theme, the new offering would be called Hideaway. Hideaway featured a formula similar to Holiday and Hearts: a mixture of acoustic and electric offerings with varying levels of orchestration, depending on the song. Perhaps one of the standout album cuts was Gerry's "Watership Down", based on the 1974 Richard Adams novel of the same name, which featured outstanding arrangements and harmonizing. On "Lovely Night," America experimented with a "reggae extrapolation," as a tour program described it. The fabulous two-part "Hideaway" instrumental featured some of George Martin's finest orchestration on any America album. On "Don't Let It Get You Down" and "She's A Liar," America went for a harder-edged sound while still retaining their trademark harmonizing. "She's A Liar" also returned to the slide guitar sound which was used so succesfully on "Sister Golden Hair." The first single released from Hideaway was the inspiring Dan Peek tune, "Today's The Day." Years later, Dan attributed the inspiration behind this song to his beloved shaggy sheepdog, Everett. Utilizing a haunting piano intro and soothing vocals, "Today's The Day" was a hopeful message song from the same fold as "Lonely People." Despite strong radio airplay, the song was only able to climb to a disappointing number 23 on the Billboard singles chart in July 1976. It did, however, top the Adult Contemporary chart for two weeks, making it America's most successful AOR single to date. In July 1976, America the nation was celebrating the bicentennial of the signing of the Declaration of Independence. America the group was receiving a certain amount of pressure to cash in on their name. Although they at one point seriously considered taking a tour of Russia, they were basically uncomfortable with hyping their name. "We never did want to exploit the name," said Dewey in a 1976 interview. "We figured [the name itself] was about as far as we needed, or should, go. So we never put American flags and things on our covers..."
It's harder for me to write a good song about something that's just a good, groovy time; there's always a "minor," as in minor chord, that I like to write about. It's sure hard for me to write about "bounced the baby on my knee" or "these fun times," you know. That isn't enough to get me to write. I always like to throw in something, get something extra; the words, the images, the colors, like purple or whatever, that have that little tinge of possible terror -- I call it menacing, that's the word. A little menacing. Minor keys, minor choruses, as in "Sandman": "I understand you've been running from the man." Or in "Midnight" and even in "Amber Cascades": "stop all the slaughter in view" -- just a word like slaughter. For all of its appeal, "Amber Cascades" was unable to rise past number 75 on the Billboard survey, and disappeared after just four weeks on the charts. Despite the lackluster performance of Hideaway's singles on the pop charts, the album itself did reasonably well, peaking at number 11 in June 1976. Even though it garnered a gold disk, it was clear that America would need more hits to get back on track. In between albums, America continued to tour throughout the bicentennial year. As the number of Martin-produced tracks grew in the America playlist, the group found it harder to reproduce those tracks in their live show. Dewey observed that it was difficult for everybody to keep switching instruments between songs. It was also nice, he added, to have a "keyboard whiz" to help out on the more complex arrangements. As a result, the group expanded to a seven-man setup with the addition of Jim Calire on keyboards and saxophone and Tom Walsh on percussion. Upon the heels of Hideaway, Martin and America agreed on yet another collaboration. This time they travelled to the Ka Lae Kiki studios in Kauai for the recording sessions. Newcomers Calire and Walsh joined Leacox, Dickey, and the original trio of Dewey, Gerry, and Dan to give the album the fullest band sound of any America album up to that time. The recording phase for the new album, entitled Harbor (in reference to Pearl Harbor on Oahu), was a lot of fun for everyone. George Martin noted that he had to constantly keep an eye on the trio in order to keep them focused on their work. Often times, they would be riding buggies or flying in helicopters, then saunter into the studio to work on tracks. Due to this clowning around, the working album title, Harry Goes Surfing, was originally put forth as a way of mocking tourists trying to fit in with the locals. That title can actually be seen transcribed into the vinyl surface of the Harbor LP toward the center of the disc. "Are You There" on the Harbor album was one of my real strong songs. That's kind of a good example because the song came straight out of the gut. We were on tour, and it was half way through the tour, and through physical abuse, basically, and some natural illnesses, we had to cancel. Daniel was one of the "illees," Gerry was sick too, and I felt this sort of "coitus interruptus" of the tour. You know, you just start rolling and WHAM! the tour is cancelled! So I came home and wrote the song -- it was like: "The day we lost our voice with little Joyce [choice], I can't explain, an act of agony." And that just came out at one sitting. That was probably one of the biggest disappointments of my time in America. I believed so strongly in that song... It was really a personal expression and a heartfelt song, and one that was really important to me. And on top of that I just thought it was a darn good song. It was released from the Harbor album, which unfortunately didn't do as well as albums we'd done in the past. And for whatever reasons, I don't know whether it was a matter of Warner Bros. didn't believe in it, or whether the radio stations couldn't get into it, or whether the public just hated it. I don't think it was ever really given a fair chance. I have my own theories about our last album with Warner Bros., which literally Harbor was the last album of new material... As far as being our last project on Warner Bros. and there being some animosity there, I think, I don't feel that it ever really received the attention that it should have from the record company. And you could say, "Oh well, that's sour grapes and the guy's just making excuses," but I really believed in that song, and it kind of hurt me that it didn't do better than it did. When "Don't Cry Baby" failed, one last single was offered, another song by Dan called "Slow Down." "Slow Down" had the latest electric keyboards, Jimmy Calire's saxophone, and funky drum and bass lines. Perhaps it was the record company's assumption that if more traditional America sounds had failed to sell, maybe what the public was looking for was something groovy and trendy to cash in on the growing disco fad. Apparently not, as that single went the way of the first two. Despite the failure of any of the singles to make a dent in the charts, Harbor itself managed to do respectably, climbing to number 21 in the album lists in March 1977. It became the first America album since Hat Trick not to garner a gold record for sales. America's commercial fortunes had declined quite rapidly from their peak less than two years before. Once again, critics were having a field day with America, poking holes in their lyrics and soft-rock style in an era when disco was the new rage, and the punk rebellion was fast becoming cool. Dewey felt obligated to defend his bandmates. "Sure, sometimes there's a trite lyric, but no triter than a hell of a lot of quote 'well-respected bands' unquote. Lyrically, there's some real jive in a lot of the heavy bands' stuff." I guess they're too nice. They don't have any sort of outrageous scenes -- kicking people around and destroying hotels. And they tend, because of that, to get underrated. They do have a tremendous following; I guess it's a large group of hard-core Americans who like something that isn't too rocky -- which is what they fit into. America made an SRO visit to suburban New York on April 20. For this 75-minute performance, the three nearly interchangeable lead singers, Garry Beckley [sic], Dewey Bunnell and Dan Peek, shared the stage with a basic rock band and a small forest of potted plants. The band moved rapidly through its material, performing nearly 20 songs, beginning with some of its better known oldies like "Muskrat Love" and "Ventura Highway," then moving to new selections from the "Harbor" LP and back to the hits, closing on "Horse With No Name." The show was well paced, with the singers beginning on acoustic guitars and the band playing quietly behind them. But as the evening warmed up, so did the show. 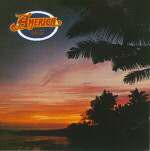 Midway through it became apparent that for all its pretty country rock harmonizing, America is also a band that rocks. And rock it did, very well indeed, bringing the audience to its feet, where it remained for a long time, bouncing along and clapping. Such an outpouring of emotion helps any performer along, and it certainly seemed to drive America to new heights, making a pleasant and exciting performance. Copyright ©1998-2000 John Corbett. All rights reserved.